Prominent & Leading Manufacturer from Vadodara, we offer magnetic ferro filter. gauss value 2500, 5000, 11,500. Offered Electromagnetic Ferro Filter for Slurry is available at the affordable rate so that everyone can buy according to the budget. This product is developed employing best raw element and advanced technology and machinery. This is made in the state the need and demand of the customers. Easy to use, we offer these filters in multiple specifications and at effective prices. 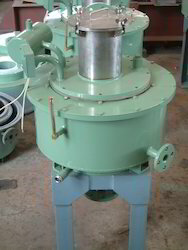 It consists of cylindrical shape body in ss construction with an electromagnetic coil is immersed in oil for cooling. A specially designed grid is placed at a center of the tank and jacketed by ss cylindrical shape body. Due to its honeycomb design of grid strong electromagnetic force is generated to separate fine to very fine iron particle from slurry. Gravity type - the liquid will feed on top and discharge from the bottom. Pressure type - the liquid will be injected from bottom and outlet will be at the top. Useful when removing the fine iron particle from the slurry is big challenged. Specially designed ss grid is staked one after another to create strong magnetic flux.